One of my favorite local comic book shops of all time is putting on a mini con and I will be there with all my bells and whistles (which means free Shero and Vex comics and Warshiner #1 copies). The mini con is Saturday, February 27th from 10am to 6pm. There will be exclusive discounts and lots of creators and artists present. Here is a link to the FACEBOOK EVENT PAGE and you can go to their WEBSITE for directions. This is my first appearance at Aw Yeah but I have been a customer for awhile. 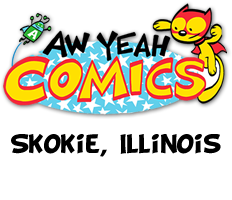 If you haven’t been, Aw Yeah Comics in Skokie, IL is an ideal comic book shop for all ages with incredible selection and top shelf staff. You can tell you’re getting close because you’ll recognize the vibrant art of artist Art Baltazar on city property. If you’re in the area please stop by and check it out, again I cannot stress what a fun and inviting place Aw Yeah is I hope see everyone there.